Bowling is a truly under-rated game. Half-way between a leisure activity and a sport, it’s fun for all ages. We think bowling can be fun for a first date, a night out with friends, or a relaxed Sunday with your family. 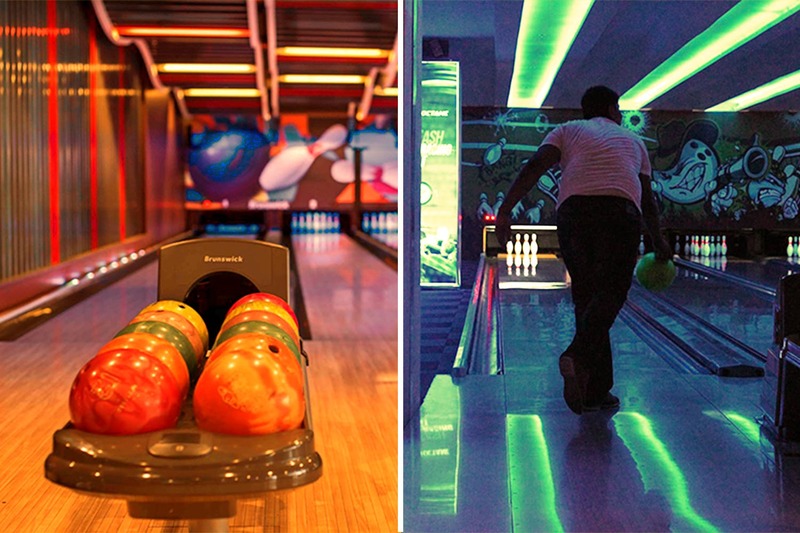 Here are 5 places in Pune where you can enjoy bowling. Pune’s first ‘Smaaash’ entertainment zone opened in December last year, at Phoenix Market City in Viman Nagar. Located in the same spot as Blu-O, Smaaash provides an indoor cricket zone, VR and arcade games, billiards, foosball, an indoor football zone, and of course – a bowling alley. Bowling here at their 6-lane alley will cost you INR 249 on weekdays, and INR 299 on weekends (per person). Smaash also functions as an eatery, serving food, drinks, and alcohol. Their multi-cuisine menu spans from appetizers to pizza, pasta, and mains – ideal for when you’re in-between games. High Octane is the sports and gaming zone at Seasons Mall, Magarpatta. In addition to their 8-lane bowling alley, they also feature VR games, an F1 simulator, snooker, air hockey, and a basketball gaming box (among other activities). Bowling will cost you INR 225 per person, but they don’t serve any food or drinks here. You can, however, grab a bite to eat from any of the eateries/the food court next door, like Fly High, Wah Marathi, Paa Roti, Becky Bees, Burger King, Sassy Teaspoon, and several others. Amoeba at Amanora Mall takes their bowling very seriously and houses a 16-lane bowling alley – the biggest one we’ve come across thus far. It’ll cost you INR 220 per head on weekdays (Monday to Thursday), and INR 250 per head on weekends (Friday to Sunday); with special bowling shoes. Amoeba doesn’t serve any food or drinks in the gaming zone, and alcohol is strictly not allowed. Other activities here include a kiddie play zone, a ‘dark house’ of horrors, plenty of arcade games (pac man, air hockey, car racing, and more). One thing we know for sure is that Amoeba will definitely bring out your competitive side! Skittles is a sports bar and bowling alley at Club 29, in Wakad. Their 4-lane bowling alley will only cost you INR 200 per person, per game. There’s plenty of seating available near the lanes, as well as closer to the bar. In-between rounds, try your hand at pool, video games, air hockey – or just sit back and relax with a drink and some good food. Skittles’ menu features multi-cuisine comfort food that’s easy to eat; think starters, burgers, sandwiches, pizza, platters, and dessert. They run daily deals and offers from Monday – Saturday, so we recommend checking with them before you make your plans. Located on the second floor of Kumar Pacific Mall, King of Game features a bowling alley, VR gaming, arcade games, dashing cars, and even laser tag! Bowling at their 4-lane alley here will cost you INR 165 per person, which is the most pocket-friendly option we’ve found so far. King of Game doesn’t serve any food or drink of their own, but you can enjoy refreshments at other eateries within the mall. Play well enough, and you may even stand the chance to take home some prizes! Almost all of the places we’ve listed here run offers, student/corporate discounts, and seasonal packages on bowling, as well as F&B. Keep track of them via their social media feeds, and make the most of it!